After a four-year rise without a correction of 10% or more, one of the longest on record, the S&P 500 index has lost 12% in just four months, most of it in three trading days. While this extreme volatility is unsettling, U.S. investors should keep in mind that the drivers, notably the continued slow-down in China and related drop in most commodity prices, are not entirely correlated to the U.S. economy. As described in the last issue of Independent Thinking, we reduced our equity exposure back to policy guidelines earlier this summer, recognizing that the high relative valuations were not sustainable. As this correction plays out, we may have the opportunity to rebalance in the other direction, to the extent that equities in client portfolios decline against the target allocations. In other words, this period of volatility may represent a buying opportunity. At the extreme end, the fear in the marketplace seems to be that this correction could precede a replay of the junk bond crisis of the late 1980s, with emerging economies, already roiled by the plunge in prices for oil and other commodities, unable to service their debt. We knew, however, that China’s transition to a consumer-driven economy from one driven by government and private investment was never going to be easy. The Chinese government clearly flubbed its efforts earlier this month to manipulate its stock market but its huge foreign reserves and centralized power structure mean that it is hardly out of options just yet. More significantly, from our vantage point, it seems unlikely there will be any significant tightening of global monetary policy at this juncture. Indeed, the current sell-off may further delay rate rises in the United States and encourage the European Central Bank and Bank of Japan to continue to loosen monetary policy. As previously noted in Independent Thinking, we have increased our suggested weightings to diversified market strategies and illiquid alternative asset classes. At the same time, we continue to actively invest in companies with secular growth drivers, some of which now look more appealing from a valuation point of view. We maintain relatively conservative and, we believe, realistic market assumptions, and will continue to balance portfolios to protect and grow our clients’ capital. 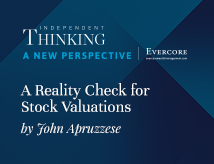 John Apruzzese is the Chief Investment Officer at Evercore Wealth Management. 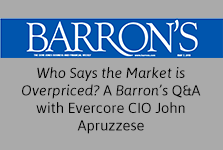 He can be contacted at apruzzese@evercore.com.